Front Binding – Hello friends! It’s been a few months, but I have acquired a couple new LEC editions that I am eager to catalog! The first is The Betrothed, known in Italy as I Promessi Sposi. 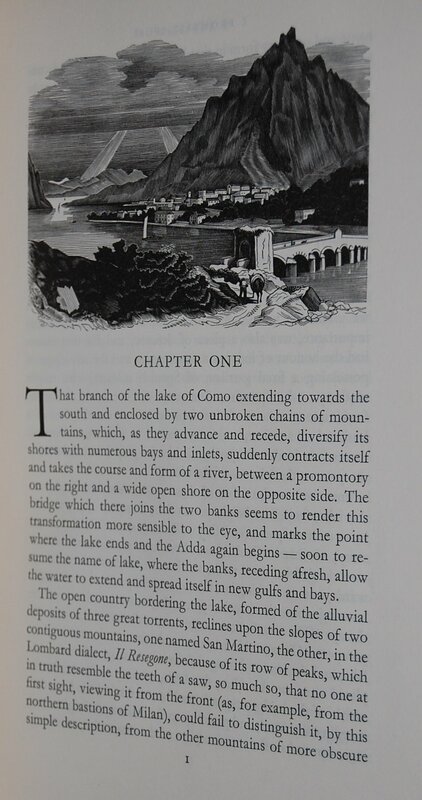 Dubbed one of Italy’s most important novels, the work was the sole work of its author Alessandro Manzoni to see a Limited Editions Club issue, but it sounds fairly interesting based on the little research I performed. The text is taken from the 1844 translation spruced up by Ronald H. Boothroyd for this publication. 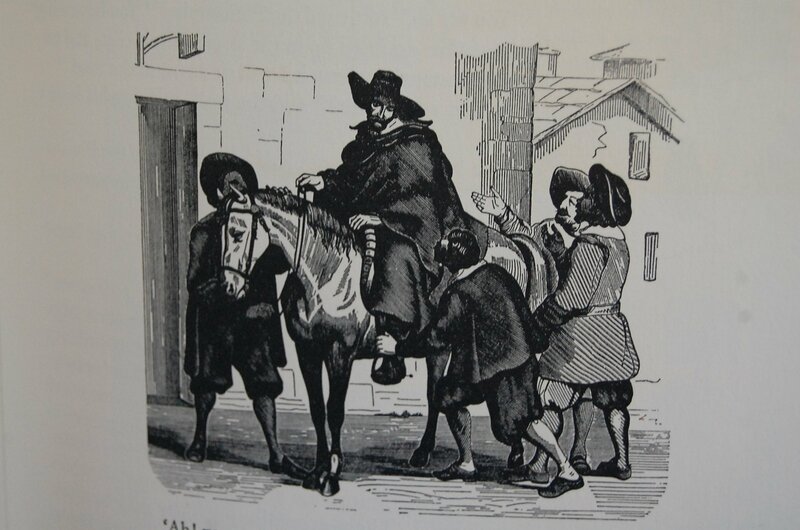 Much like the text, the artistic direction also takes from the past; in this case, Francesco Gonin’s wood engravings issued in 1840 for the original Italian release commissioned by Manzoni. To modernize those for this book’s release, Bruno Bramanti was recruited to recreate them via his own set of wood engravings. Bramanti would reunite with Hans Mardersteig for their next two LEC commissions The Georgics and The Gallic Wars, but would provide his own unique cuts for those volumes. Design Notes – Giovanni “Hans” Mardersteig at the Officina Bodoni in Verona, Italy served as designer, with the Officina acting as the printer and bindery. Mardersteig handled several books for the LEC, although this is the first one we’ve seen on the blog from the Limited Editions Club proper; although we have covered a few Heritage reprints. The esteemed printing house has been tied with George Macy since the second series with The Little Flowers of Saint Francis of Assisi in 1931, followed by The Divine Comedy in 1933, Imaginary Conversations in 1936, The Life of Benvenuto Cellini in 1937, this volume in 1951, The Georgics in 1952, The Gallic Wars in 1954, The Last Days of Pompeii in 1956, Metamorphosis in 1958, Quo Vadis? in 1959, Toilers of the Sea in 1960, The Trial and Death of Socrates in 1962, The Lives of the Twelve Casears in 1963, The Sonnets of Petrarch in 1965, Lives of the Most Eminent Painters in 1966, The History of Early Rome in 1970, and The Renaissance in 1976. You’ll notice a large gap in years between Cellini and today’s topic; as a printer based in Italy, you can likely suspect that the country’s role in World War II had a significant impact on their operations, especially with American-based companies. But back to our book at hand: the font chosen was Garamond, which was printed on Fabriano paper along with Bramanti’s engravings. A half-natural Italian linen was used to bind the boards, and the spine features a gray-linen block stamped in gold. The book has hand-painted paper sides. Dustjacket – A curious addition to any Limited Editions volume; the only other edition I personally have with a paper sleeve is Vanity Fair. According to the Quarto, this was a tradition for the Officina Bodoni publications. What’s neat is that it also has the limitation number painted on the spine as well (see below). Spine – Unfortunately this book suffered some foxing while it was in storage, but I intend to try to curb it in the future. Thankfully it does have the paper sleeve to help hide the damage. Title Page – As noted above, Boothroyd updated the 1844 translation, but also served as the book’s Introduction writer. Colophon – This is copy 92 of 1500 and signed by Bramanti and Mardersteig. Page 1 – The woodcuts in the volume are small in size but packed with detail. While I prefer what I’ve seen from Ward or Eichenberg, these are quite nice. Personal Notes – My dear friend and resource Robert (Django6924) had decided to unload several duplicate volumes he had amassed over the years, and I jumped at this one and the next post we shall see. I would have loved to have received more from him, but alas, financially that wasn’t feasible. But I am very happy to have these two books in my collection; thank you! You are currently viewing the archives for May, 2018 at The George Macy Imagery.